Or girlfriend. Or that customer service rep at the insurance company, your cable provider, or any one of those monolithic corporations that cyclically make your head explode. You’ve exhausted all worthy material but you keep going just for the sake of “principle.” Every known argument has been made, debated or deflected to no avail, but you can’t keep yourself from hitting even lower below the belt. Any reasonableness or respectfulness of earlier has devolved into epic flinging of invectives and epithets, some you didn’t even know you knew. The mantra of “wait… just LISTEN! !” comes with increased decibels of volume and venom to the point that neighbors call, dogs bark; walls are up, minds are closed, stress chemicals flow, rational thought exits, and no one can possibly win because it’s a zero sum game. But still… you keep throwing that mud until someone finally collapses under the weight. 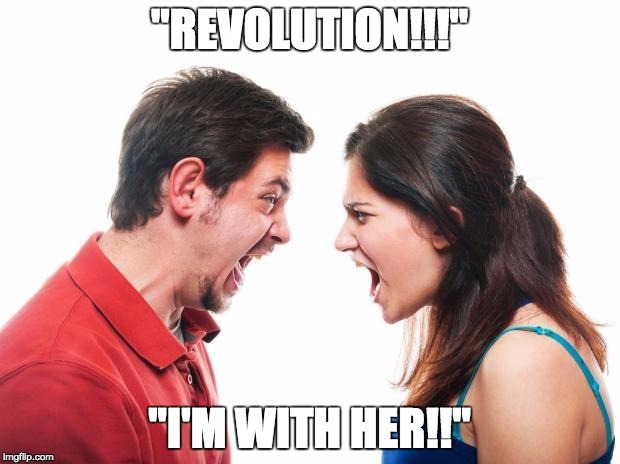 Welcome to Election 2016, the Democrats. We Democrats probably reached the zero sum game months ago. Or at least after the New York primary. When the idea of trashing the winning candidate to aggrandize the other just made the entire ticket seems as nuts as the Republicans. Beyond the math, beyond arguing the math; beyond delusion and fanaticism and revolutions and glass ceilings and wishful thinking and slogans and hashtags and conspiracies and finger-pointing and idiotic celebrities and Westboro-style harassers and sexism and ageism and all of it, the jig is up. Whatever you think the ending is going to be isn’t the point. You can have hope, you can have faith, you can keep fighting the good fight, but fighting the bad fight gets us nowhere. And we are fighting the bad fight. And it is getting us nowhere. Let’s be honest: we’re deep enough into this thing that odds are good everyone’s taken their positions. They know where they stand, who they’re supporting and why, so preaching from here on out is only to the choir. As long as folks are happy with that harmony, keep on a’preachin’! But anyone who thinks there’s anything to be gained from the incessant posting of the most incendiary, salacious stuff they can find on the other candidate in hopes of — what? convincing someone to jump on their bandwagon? — has missed the trajectory of this narrative. Even if — in the most random of circumstances — there really is anyone left who doesn’t feel informed enough to make a choice, that person has to know they aren’t going to get an unbiased, objective education from the posts of oppositional supporters. Let’s start with that truism. So, given that, may I suggest to ALL who continue to post ridiculous things like videos screeching, “If you would still vote for Hillary Clinton after watching this 4-min video…,” or anonymous blog posts by someone who’s talked to someone who knows a doctor who says Sanders has Alzheimer’s, or scurrilous and slanderous propaganda from sites run by known Hillary-haters, or unsubstantiated dirt on Jane Sanders, or slimy posts about Chelsea Clinton’s mothering, or…STOP. JUST STOP. It’s over. The fight is over. It no longer has any merit whatsoever and continuing it will only toxify any good thing that still exists between you and the other side and what’s the point of that? There’s still Trump out there. If, despite the math, Sanders supporters want to continue to promote positive information about their guy as a way to keep the team going, great. If Clinton supporters want to shout their enthusiasm from the rooftops, they should be able to do that without enduring a gauntlet of verbal abuse. But beyond in-house, in-candidate, to-the-choir pumping up, there is no where else to go with this fight. We’re at that point. It’s obvious, everyone knows, let’s not get the neighbors on their phones again. When you hit the wall-of-no-return with your customer service rep, that call is terminated (either by you or them), services may be cancelled, grievances may be filed. When you reach that point with a significant other, one of you has to have the wherewithal to shut the f**k up, leave the room/house/apartment, walk off the adrenaline, and detach until both parties can manage rational conversation, sincere apologies, and a willingness to let go of past rancor (that’s a big one!). And at that point in a party primary, everyone on oppositional sides has to put down the swords, eschew further debasement, and attempt to reframe the debate. There has to be a willingness to reconsider whatever indoctrination has been amassed or allowed to flow freely, to change the filter to look at the bigger picture, to see past preconceived ideas, and find a way back to party unity. That’s what grown-ups do. That’s what this party needs to do. Now. Not later. Now. Whatever happens at the convention is another moment. This moment is the one where we acknowledge the zero sum game we’ve been fighting and step off this battlefield, to rejuvenate and rehabilitate to take on the bigger battle ahead. Are Democrats and those in their camp willing and able to do that? I don’t know. I hope so. We’ll have our answer when the intra-party, click-bait, poop-throwing mud-fest on social media finally stops. That can’t happen soon enough… I swear I hear the phone ringing. Brilliant! Thank you! Will share. I know it likely will not do any good as those people who are posting this kind of crap about the “other” candidate are too far gone and too biased and too much in their egos to pull themselves back from the ledge. But if anything can do it….maybe your wonderfully written article can. Nice job, Laney. Thanks, Pate! I’ve discovered that sometimes the frustrations of the day — certainly in looking through media and social media to see the insanity going on in this election — leads me to HAVE to speak up in some form or another. This is one of those!